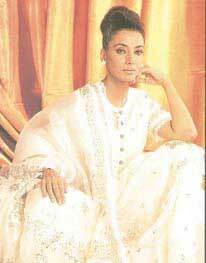 The word Lukhnawi, literally meaning from the region of Lukhnow, stood for nawabs, etiquette and richly embroidered, thin muslin kurtas. Filigreed leafs, petals, vines, roses, lotus, birds, peacocks and arabesques and the inevitable paisley, decorated thin kurtas which were ideal for summer heat. You could have elaborately criss-crossed embroidery or just basic work done on the neck as chic casual wear in the tropical heat. Today, the same work is proudly worn by Dame Judi Dench to the Oscars. Back home, Jaya Bachchan flaunts her flowing Abu-Jani kurtas, the Kapoor sisters, Kareena and Karisma wear theirs to filmi and non-filmi functions, Dimple Kapadia makes her graceful statements in chikankari on loose salwar kameezes. 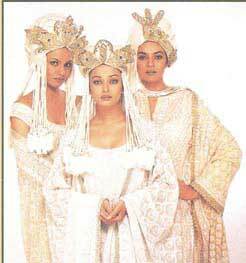 From mere summer wear in the Indian heat, chikan outfits have become statements of high fashion. Chikan work done traditionally on light weight fabrics is sensible for the summer and whimsical as the breeze. The self colored or white embroidery is dressy without being ornate. Designers Abu Jani and Sandeep Khosla, known for their Chikan collection, call it an all time classic style statement. Royalty turned designer Muzaffar Ali is proud to include chikan work as part of his Kotwara label giving the 18th century craft a zari touch. The name chikan seems to have been derived from the Persian word, either chikan, chikin or chikeen. It means a cloth wrought with needlework. With its light gossamer quality, chikan has evolved as a logical answer to the problem of keeping cool while also providing adornment and beauty to one’s person. Most of the design motifs in chikankari are Mughal-based, also seen in the ornamentation at the Taj Mahal and Fatehpur Sikri. While the nawabs played an important role in preserving the chikan heritage, it has now been given a contemporary touch by designers. 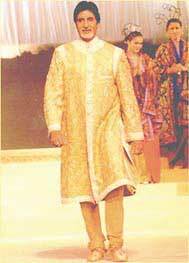 Abu Jani and Sandeep Khosla introduced their first chikan work collection a decade ago. Muzzafar and Meera Ali moved away completely from the white on white and pastels and created garments with gold and silver chikankari work on black for formal wear and even bridal wear. Darshna Kinariwala from The Leela Studio, Hemant Trevedi and Manish Malhotra in the Sheetal Design Studio also contributed to make chikan work haute couture. Anita Dongre presented her pastel collection of chikan work for the Spring-Summer 2001 season in pastel shades of pink, acid green and turquoise blue. Anita Dongre’s collection comprised nearly 12 garments of sarongs, blouses, trousers, tops, scarves, asymmetric tops and skirts in crepe, georgette and chiffon. Now that chikan has a designer stamp, and has decorated the ramp in casual wear, it is being increasingly seen on street sides too. Bright fruity colors with white embroidery worn over singlets are very popular with collegians. While chikan in India is known for not only hand embroidered but hand stitched garments, pre-embroidered fabrics which offer a blend of international and Indian motifs in Schiflee embroidery have also been traditionally popular. Hakoba embroidery on pastels and white has been a part of traditional summer wardrobes. Designer Tarun Tahiliani tried to revive the machine technique of chikan work, which was popularized by Hakoba in the ’60s and was a rage of that era. Designer Pria Kataria Puri has used Hakoba fabric for her lace collection, “I have used pre-embroidered fabric for a jali effect. It looks like exquisite hand embroidery and gives a see through look. I have used stones, bead work and silver thread to embellish it further.” A see through lehnaga with a georgette churidaar and a hakoba bustier completes the outfit. Pria Kataria Puri affirms, “Internationally pre-embroidered fabrics and lace are doing very well.” The Indian touch in Schiflee embroidery has always been popular. This new revamp is likely to spell good news for those who like their summer to be decorative. The point of the needle darts back and forth, teasing the weave of the fine muslin, mull or cotton. Each stitch is diligently added till a perfectly filigreed leaf appears part of a tracery of petals and vines, roses, lotus and “amris,” of birds, peacocks and arabesques. In its heyday in the 17th and 18th Centuries, Lucknow’s chikankari rivalled the best laces of Europe, and even today, its repertoire of 22 stitches spell ethereal magic on fabric. Taipchi: a type of stem stitch used to make outlines of motifs on sarees. Shadow work: probably the first of chikan stitches, ulti bakhia forms a base. It involves outlining inverted forms with minute stitches producing an opaque quality. The shadow on the outside is caused by the stitches on the inside of the cloth. A variety of stitches and different grades of threads are used to form the patterns.